96 Normal 0 false false false EN-CA JA X-NONE Hi everyone. 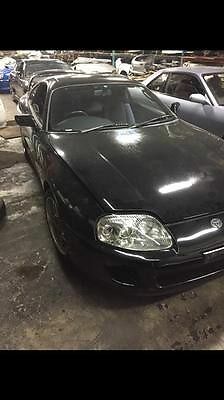 Up for sale is my RARE CUSTOM **TURBOCHARGED** TOYOTA SUPRA, 6-speed manual, Targa, with an extensive list of upgrades. 127k miles on the body. The engine and internal parts have less than 20k miles. Overall paint and parts in excellent condition. This car is fully loaded with AC, Power Windows, Power Door Locks, Power Mirrors, Power steering, etc. Built from the ground up by one of the best in the aftermarket world, this UNIQUE Supra Turbo was designed and developed specifically to provide outstanding levels of POWER and PERFORMANCE in one mean machine. Plus, it has unbelievable handling with its upgraded suspension and EXTREMELY Wide Racing Wheels. The car is black-on-black. 20" black HRE wheels with chromed lip (alone worth ˜10,000$). Red Sparco racing seats with 5 point harness. 2JZ GTE engine making 1000+ HP at max PSI on street VP Fuel MS 101. It has a clear Title, clean Carfax history and all inspections were done. 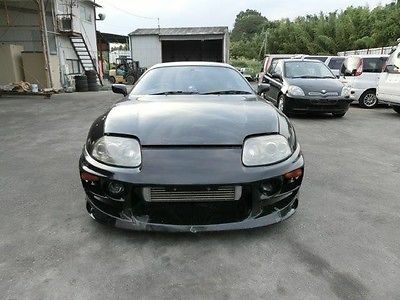 To my humble opinion, this is one of the nicest and most powerful Supra currently for sale. And it is one head-turning piece of art. Well over 100,000.00$ invested into the car. And she is worth every penny.Please contact me with any questions on the car. The car is in perfect condition so what you see is what you get. Please only contact me if you have the financial capabilities to buy this car. 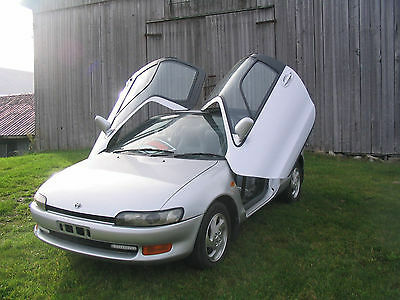 I have had two incomplete transactions on the car recently and would like this current listing to find the right buyer. Plus the car is priced to sell fast. Thank you all for your interest in my car and happy bidding. 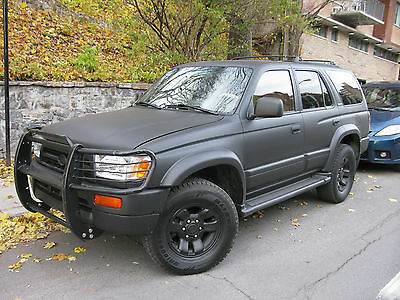 Up for sale is my precious 1998 Toyota Limited 4 Runner. Car has been meticulously maintained and runs flawlessly. Over 5000$ in new parts and upgrades this year alone!!! It breaks my heart to sell it, but as this is my 3rd/winter car and I now spend winter abroad and no longer need it I have decided to part with it. Car features: -optional 2x4 or 4x4!! press one button and save gas! or go into 4x4 mode when needed! - truck has fresh custom black plastidip, amazing and unique look, makes all the heads turn! - front push guard - has a LCD center screen/radio/gps/dvd as well as screens in the headrests( don't know if these still work as I haven't used them in 5 years, but they are wire and there) - leather seats, sunroof, wood trim... all the luxury of the Limited Model. - 3 inch suspension lift for that cool look as well as offroad and deep snow performance. - only 141 000 original miles!!! - truck comes on winter tires on mags(seen in pictures) will also come with 4 summer rims with summer tires( summer tires are worn and need to be replaced) - remote starter is installed but is disconnected. - updated brighter and clearer headlights!! - dimmed brake lights in the back - AC and heating runs great Work done in the past 18 months: $$$$!!! - new rear suspension -new battery and wiring (starts every single time no matter what the weather!!! - complete new exhaust system - new front brakes - new windshield - new ball joints - All new spark plugs and wiring - new power steering belt, new alternator belt -new drive shaft - new link kits And much more !! I care for my cars and do not spare any expense to keep em reliable and running great!! 2200$ in new parts and maintenance from Midas in august 2015!!! I have all the receipt available. This car is 17 years old, so there is a little wear in the interior and the front right fender is a little bit dinged, but the truck was just re-painted so it looks absolutely stunning! And more importantly it runs amazing, is reliable and safe!! !Unbeatable ride for offroad trips to the country or for the winter commute! These truck are know to last to 500 000 miles and more!A true warrior classic, they don't build em like this anymore! I am selling the truck as is, inspections and visits are welcome. Any reasonable offer accepted, but if I don't get a set minimum I will keep it till it reaches that half a millon mile mark! 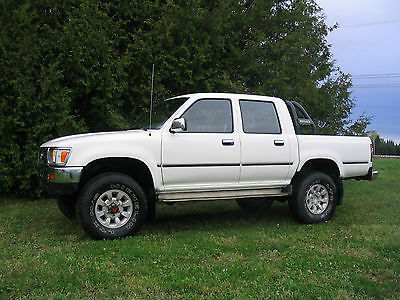 Truck is in Montreal Canada, buyer must arrange pick up or shipping. Contact me with any questions. Thanks ! 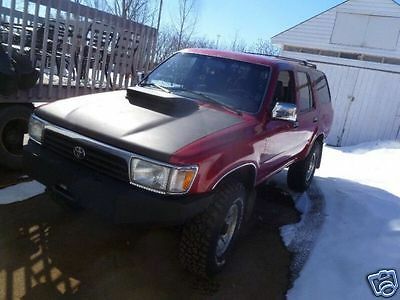 -- A video can be see Click Here -- Selling my Left Hand Drive Toyota 4runner Turbo Diesel Intercooler, with engine Toyota 2.4L – 2L-TE (Fuel Injection) and automatic transmission. It has a full swap of engine and transmission, cluster Panel, ECU,etc, from a Toyota 4runner SSR/Surf. More about this kind of swap swap can be found at importperformanceusa.com/toyota-diesel-swaps/ -- Car was brought in from Ontario, inspected, approved and licensed to Quebec in 2013. SAAQ documents included. Treated with anti-rust since 1992. -- Collection car just brought out of an interior storage, not used in winter. -- Everything perfect, no rust, outside, inside or under. -- All glasses ok, no scratches or cracks. -- Inside is very good. -- Quality sound system, Alpine with MP3 connection, ampli and quality speakers. -- Toyota optional system for the winter, with 2 batteries for cold starts. -- Seats in good shape with lots of adjusts, position, up, down, etc. -- Everything electric. -- 2 hoods, one installed with scoop for the inter-cooler, and a second one, original and painted with the car color, in case of removal the inter-cooler to have it back to original. -- Instrument to monitor water temperature (Cold Start), another one for the turbo pressure and a third one for the exhaust temperature. Turbo with original pressure, but due to the inter-cooler can be brought to the double of the pressure with a simple adjust. -- BFgoodrich 31 inches MUD Terrain tires, installed this winter, paid 1200+tx. -- Bumper off-road with whinch support, paid 1500+ installation 2 years ago. -- AISIN free Wheel hubs installed in 2013, so the front wheels can spin free during summer and on-road use, saving diesel. Paid 500,00 + installation. -- DRL with Leds -- Main headlight with Xenon 6k. -- New start heating plugs -- New brakes from last year. -- Pro-Comp Shocks installed all around. -- Radiator water heating system for cold starts up to -45C -- Very economic and powerful, lots of torque -- Truck had about of 228000 kms when the diesel drive-train, with 140000 kms was swapped in. Odometer reads today 148500 kms. -- No taxes to be paid (In case stays in Quebec). -- Original Hitch that holds up to 5000 kilos, with electric connection. -- The vehicle is in Vaudreuil Dorion - Quebec - Canada, and can be viewed either in Vaudreuil or St Laurent. -- A deposit of US$ 500,00 is requested after the auction finished, that can be transferred to a RBC bank account. No paypal payment accepted either for deposit or final payment, that can be made personally in cash or transfer to my bank account. In case of bank transfer, the car can be picked up only after the funds confirmation on the bank account. 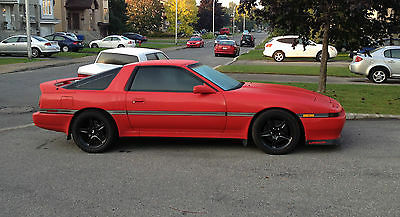 Up for sale is my treasured 1989 Toyota supra turbo targa. the car is fully loaded and has power everything, all still working. I've had the car since 1999, taken good care of it and restored it. for the first couple of years of the cars life with me i had it serviced at toyota, only toyota parts were used, i still have all of the recipts. The engine has been rebuilt and now has 8000km on it. the chassis has 118000km on it. Bodywork has been done to fix the minor rust spots. I have pictures of almost every stage of the cars life with me. There is a major list of things that have been modified and changed. they include: Engine: 45000km engine and transmission bought from jdm shop, engine was rebuit after purchase, new cam shafts, new crank shaft, HKS 2.0 bead type head gasket, arp head bolts, arp rod bolts, je forged pistons, eagle forged rods, high flow oil pump, aem cam gears, gates timing belt, new OEM water pump, RC 550cc injectors, clear cam cover, Unorthodox racing crack pulley, lightweight flywheel, strong RPS streetable clutch 725 torque capacity, light weight one piece titan motor sports aluminum drive shaft, 3.73 LSD, steel braided clutch line, new clutch master cylinder, solid intercooler piping kit, Greddy blow off valve, walbro 255 fuel pump, Aeromotive adjustable fuel pressure regulator, gas tank was rebuilt, HKS intake pipe, greddy boost controller, greddy turbo timer, innovate wideband O2 sernsor and data logger, innovate a/f ratio gauge, boost gauge, dual gauge pillar pods, new 140 amp alternator, Megasquirt stand alone fuel management system, Titan motor sport 3 1/4 down pipe with turbo elbow, full Blitz nur spec 3inch stainless exhaust, flexalite Dual electric fans, koyo aluminum racing radiator Suspension: Tokico blue shock, eibach springs, new front lower table bushings, Cusco front and rear strut bars. Brakes: vented Discs with axxis metal pads, new OEM rear calipers The car sat in a garage during its rebuild and restoration for many years (2001-2009). I finally finished it a dynoed it, with a stock turbo (about the only stock piece left on the engine) it made 340rwhp and 370ft-lbs. Add a strong turbo and it can put out more than 500rwhp easily. The engine was originally built for high hp and is virtually ready, all it needs is a turbo. The car is in great shape and needs a good home. i have all receipts for this car, totaling 40000$. Im asking 7000$ for the car which is a steal. Dont miss out. 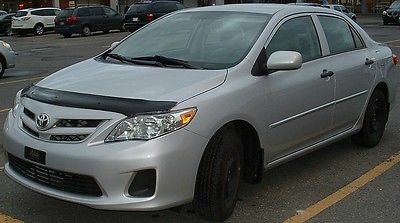 Toyota Corolla 2012 with only 7500km! The car is like new! On Manufacturer's Warranty! Dealer installed Hood Deflector and Side Moldings. Non smoker's car. Very clean, no accidents, only one owner. Includes 2 sets of Windshield Wipers (Winter and Summer (Brand New Original TOYOTA)). Includes 4 Brand New Wheel Covers (not shown in the pictures). Includes 2 sets of 4 Floor Mats (Carpeted and Rubber). Includes 4 almost new winter tires on steel rims (they were used for 2 winters on this car and only have around 2800km on them). Why pay full price if you can lease at only 0.9% interest. Lease take over for 3 years at $185.93 per month with all taxes included! After the lease end the car can be purchased for $5710 or returned to Toyota. $0 Down. Buyer pays lease transfer fee. DO NOT CLICK "BUY IT NOW", JUST SEND ME A MESSAGE. 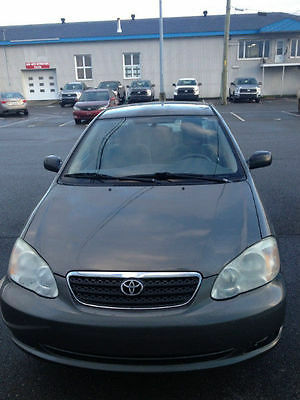 =================================== Toyota Corolla 2012 avec seulement 7500 km !!! La voiture est comme neuve! Installé par le concessionnaire déflecteur de capot et Moulures latérales. La voiture de non-fumeur. Très propre, pas d'accidents, un seul propriétaire. 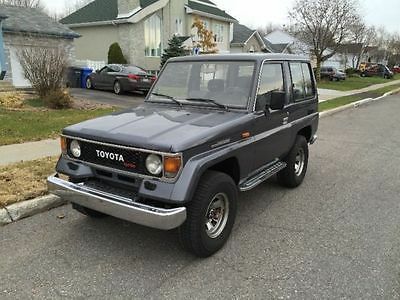 Comprend 2 jeux de Essuie-glace (hiver et d'été (neuf d'origine TOYOTA)). Comprend 4 marque couvre les nouveaux pneus (non représenté sur les photos). Comprend 2 jeux de 4 tapis de sol (moquette au sol et caoutchouc). Comprend 4 presque neufs pneus d'hiver sur jantes en acier (ils ont été utilisés pendant 2 hivers sur cette voiture et ne disposent que d'environ 2800 km). Pourquoi payer le plein prix si vous pouvez louer à seulement 0,9% d'intérêt. Transfert de bail de 3 ans à 185,93 $ par mois toutes taxes comprises! Après la fin du bail, la voiture peut être acheté pour 5710 $ ou retourné à Toyota. 0 $ comptant. L'acheteur paie les frais de transfert de bail. NE CLIQUEZ PAS SUR "Acheter maintenant", il suffit de m'envoyer un message. Toyota Corolla 2012 Toyota Corolla 2012 avec seulement 7500 km !!! La voiture est comme neuve! Installé par le concessionnaire déflecteur de capot et Moulures latérales. La voiture de non-fumeur. Très propre, pas d'accidents. Possibilité de louer pour 3 ans à 185 $ par mois toutes taxes comprises! Option d'achat de la voiture après le bail à $ 5710. L'acheteur peut acheter la voiture pour de l'argent à 14,200.00 $ ou reprendre le bail à 185 $ par mois toutes taxes comprises pour 3 ans. ---------------------------------------------------------------- Toyota Corolla 2012 with only 7500km!!! The car is like new! Dealer installed Hood Deflector and Side Moldings. Non smoker's car. Very clean, no accidents. Option to lease for 3 years at $185 per month with all taxes included! Option to purchase the car after the lease at $ 5710. The buyer can purchase the car for cash at $14,200.00 or take over the lease at $185 per month all taxes included for 3 years. Price is negotiable. Please feel free to message us. 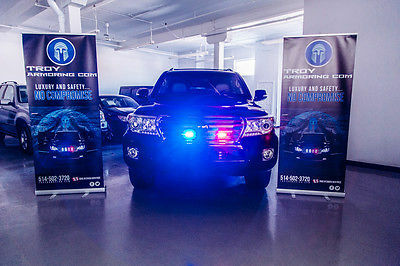 We will deliver the vehicle if buyer resides in Quebec or Ontario. Buyers from other Canadian provinces can pay shipping fees upon arrival of vehicle.